On my last day in Paris I wanted to see Pierre Herme’s patisserie. I found it, but there was a long line up, and I decided I didn’t have time to wait. So, I continued and my good fortune was on the next block in the form of Laduree, which was supposed to also have wonderful macarons. I had read debates on Chowhound board over whether Laduree or Pierre Herme macarons were the best, so I was hopeful. I looked over all of the choices, and finally asked the clerk (who was dressed up very smartly in a suit) which were his favoutires. He said chocolate and caramel, so that’s what I bought. I had no idea how much they would be as they are sold by the gram. The total was about 3 euros, about $5. I had tasted other macarons during my travels outside of Paris, and none had been that good, so I was hedging my bets. It was the coldest and windiest day of my trip, and as I left the wind was chilling. I walked half a block and then thought I should taste them before I got too far away in case they were really good. I opened the bag, stood my a wall, looked them over, and took the first bite of the caramel one. It was devine – crisp outside followed by a lucsiously soft inside, then the intense sweetness of the caramel, with a bit of salty flavour as well. I decided to taste the chocolate as well, and it was equally wonderful. After eating these, I was really full, they are very sweet and also the filling is buttery, I do not want o know how many calories!! Because I also was off to try croissants at what I remembered as the best croissant place, I decided not to go back, but I still regret not bring a couple back to Canada. I figured they would get crushed anyway. I had bought a couple French cookbooks on Macarons, so I was so pleased I had tried what I now considered the true benchmark for a good Macaron. Upon returning and having time to cook, I proceeded to try to make them. After trying one bartch that tasted ok but did not have the characteristic “foot” they get when they rise, I did some more research and tried a recipe that used Italian cooked merangue as the base. This was in an article on the web Desserts Magazine, an article I highly recommend. So, I was finally successful in getting the feet, and made a chocolate ganache filling. 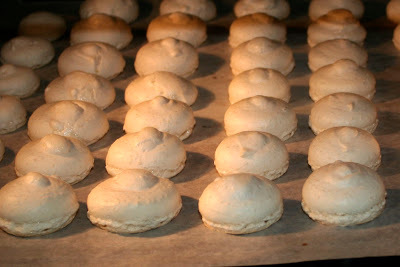 I took my macarons to a Christmas party, they they all disappeared quickly, and several people asked how to make them. When I described my process, no one then pursured the recipe, I think I am the only one crazy enoough to want to pursue this perfection. My macarons were good, but what I learned on this second batch is that you have to be very careful not to overcook them, and also they improve after aging in my cool fruit cellar for a couple days. This entry was posted on Wednesday, February 4th, 2009 at 8:21 am	and is filed under Uncategorized, baking. You can follow any responses to this entry through the RSS 2.0 feed. Both comments and pings are currently closed.